The Panama Canal celebrated its 100th anniversary last year, having seen more than a million ships pass through. Panama took control of the canal from the US in 2000, and has since been widely praised with the way it has handled the operation.Transit fees now bring in about $1bn (£645m) a year for the government. Original report: Panama Canal to limit ship size due to drought – BBC News. 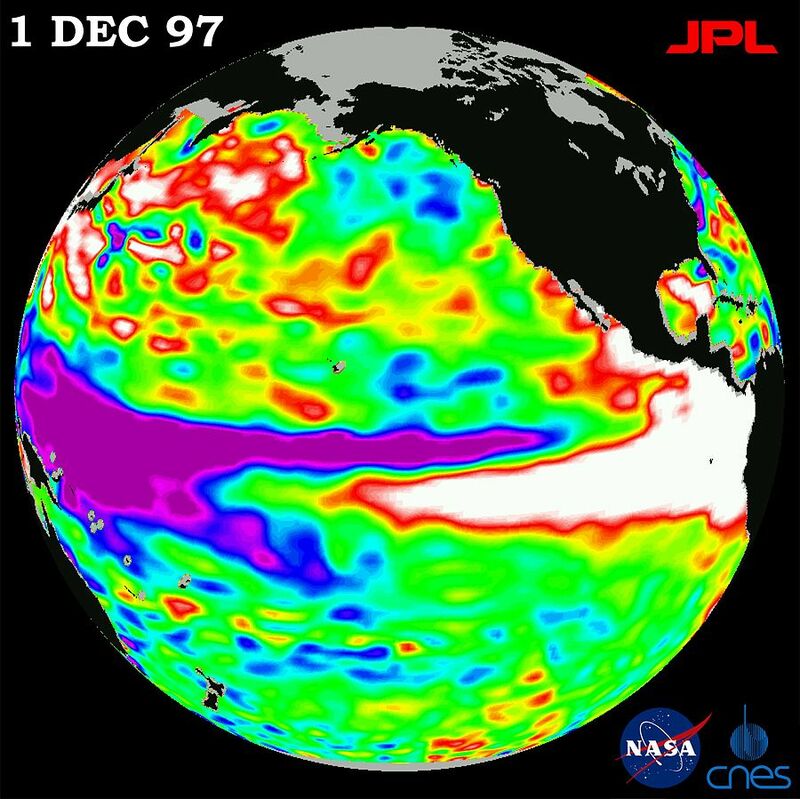 ‘The El Niño weather pattern often brings deluges to California, quickly dropping inches of rain in what climatologists liken to turning on a fire hose. What is the tidal range relative to these temperature induced sea level changes? Never knew they used lake water for the locks. Not a good idea in an area subject to drought. Richard: the lakes are man-made, created by damming rivers when the canal was built. Fodor’s says Gatun lake – the main one – encompasses 163 square miles. How does temperature alter water level? tc: here’s an extract from the IPCC version. If you mean water level in the canal, drought = much less rainfall than usual to top up the lakes which are a large part of the crossing (see BBC graphic in the linked report). warm water is less dense and floats on top of cold water. Although I wasn’t aware of the magnitude before now. So 3000 feet of water or was it hotter, mysteriously heats up in how long? Or is there spin going on? Trust face value? I know most people are just confused by this sort of thing and find it too frustrating trying to think about it …but it’s the interesting stuff because the symmetries of turbulent coupling are clear. For a lot of these variables it’s not about whether A causes B or B causes A but rather simply recognizing coupling of A & B and not being thrown off track by spatiotemporal aliasing …like for example surface sampling of temperatures doesn’t capture latent stuff and it doesn’t capture vertical action (atmosphere-ward & ocean-depth-ward) or even basic wind-driven eddy structure. We need to be heeding Hsieh’s wisdom about not fitting noise when probing exogenous backbone attractor structure. At wuwt they disregard his sage counsel and as a result they’ve been misled *way* off-track by activist dark agents. It’s funny watching how stubborn they are about not correcting their work. It’s all about recognizing simply symmetry & asymmetry. Best get some dredgers in there to deepen the cut! Steve, they are already working on it or in scheduling phase. Upgrading the whole system for the super carriers (366 m length – 13,000 – 14,000 TEU) to get through vs 294 m length.